It was hot and no shade…the kids were energized and excited to be out of their daily routine. It was the schools annual Boosterthon Fun Run! 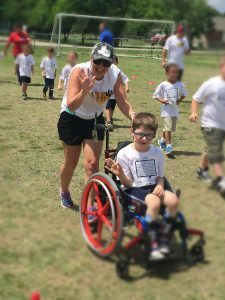 Each year Linden’s school hosts a fun run to raise money for teacher grants. Linden raised over $300 in donations and pledges this year and we couldn’t be more proud. Really it started with me reaching out to family and friends that we knew asking for donations. For each donation and pledge made in Linden’s name, it pushed him to do more laps. I had anticipated him completing 30 but he out did my expectation and did 35! He had a fan club come and cheer him on; Maw Maw and Paw Paw. His grandparents drove up from Dallas to see him complete his laps. Of course his favorite fans were there too, Mommy and Daddy. 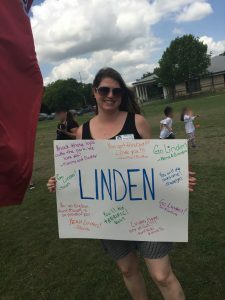 At first when the Fun Run came about in emails and newsletters at school, I waited to see if there would be an email asking me how I would like Linden to participate. After no email in sight, I decided to reach out and address the elephant in the room. His kinder teacher and special ed teacher were on board and were excited that I had pushed for his participation. 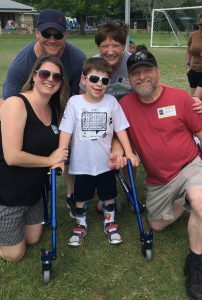 The original plan was for him to complete his laps in his wheelchair per his teachers however I just couldn’t accept that. I pushed for him to do them in both his wheelchair and walker. He completed the first 33 laps in his chair and the final two in his walker. He did wonderfully. 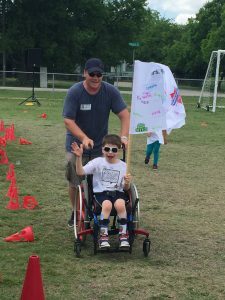 The smile on his face and the high-fives given around each lap showed that him and his classmates were loving the run. They had water stations set up for the kiddos however they were troupers and kept truckin’ along the track with very little stops. I was so proud of all of them! 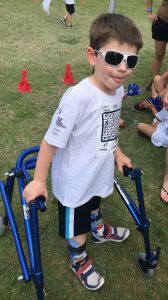 After it was all said and done, he completed 35 laps and raised over $300 for his schools teachers. I am thrilled with the amount of money donated by family and friends. It shows that people are present and rooting for Linden’s success. The money was more than just teacher grants. It was to prove Linden can do it! He can do it all and will continue to become stronger and successful. It proved that people have full faith and heart in his abilities to thrive. Thank you everyone for your continued support of our Little Warrior.